You might have heard that Kris Bryant had a pretty good game last night. He became the first player in baseball history to hit three home runs and two doubles in the same game. His 16 total bases are the most ever by a Chicago Cub in a single game. He became the youngest Cub to hit three home runs in one game. He pretty much single-handedly willed the Cubs to victory. He did so while playing three different positions during the game. We've seen enough now to know that Kris Bryant is really good. He's one of the best players in baseball. I shouldn't have to tell you this. But, still, there was some concern about him heading into this season. There was a case to be made that Bryant was due some serious regression from his Rookie of the Year campaign in 2015. That's not the only article suggesting as much. There were a plethora of articles talking about the same things. A simple google search of 'Kris Bryant regression' yielded nearly 200,000 results. A similar search of a similarly talented, young third baseman that also had a breakout season last year, Nolan Arenado, yielded fewer than 20,000 results. People weren't ready to buy all the way in on Bryant. The concerns were valid. Of all qualified hitters last year, Bryant ranked dead last in contact %. If he didn't improve in this area, he was going to be hard pressed to realize his ceiling. Bryant also had a .378 BABIP (batting average on balls in play) last year. This was the fifth-highest in the league. Some guys can maintain high BABIPs; look no further than some of the other names high on that list last year: Miguel Cabrera, Joey Votto, Paul Goldschmidt. But one season's data isn't enough information for us to definitively state that Bryant is one of those guys. And most guys do regress back to the mean, so being cautious when examining Bryant is warranted. There were also a few other things with Bryant's 2015 season that stuck out to some people as fluky. Bryant got a lot of value out of his defense and his speed. A lot of people weren't quite ready to view this massive 6'5" power hitter as the athletic marvel that he is. Bryant led the league in infield-hit %. He reached base more often on his ground balls than Dee Gordon. There's actually a couple things that contribute to Bryant being so proficient at beating out infield hits. For one, he hits the ball really hard. His ground balls will often be more difficult to field than Dee Gordon's because they might be smoked right at a fielder. Also, Kris Bryant is really fast. In that above link, you see that Bryant can match any known burner in terms of top speed. It might take him a little while to get going, because he is trying to haul around the body of a hulking slugger. But he, unquestionably, is really fast when he gets moving. This explains why these other guys are more prolific base stealers. They are fast at the drop of a hat. Bryant can't go 0 to 60 like they do. He's better able to do things like stretching a single into a double or taking an extra base on a throw. He did both of these things last night. This is where he gets most of his value with his legs: first-to-third, scoring from first on a double, and other things while he is already moving around the bases. He's got 15 career stolen bases, but that's not really his forte. But for impartial observers that haven't watched Bryant as much as you or I, well, you can't fault them for not realizing exactly what the league has been dealing with in Bryant. Fangraphs has a stat called BsR that is an all-encompassing measure of a player's base running. It looks at stolen bases, extra bases taken via the methods I mentioned in the above paragraph, the ability to stay out of double plays... you name it. Kris Bryant ranked fourth in all of baseball in BsR last year. And this just didn't seem right. To be fair, he hasn't been quite as good this year. He only ranks 15th in BsR this year, just above Billy Burns, Jean Segura, and Melvin Upton Jr. And he also dropped down in infield-hit %. This year, he only ranks 12th in the league. So maybe he's not among the top 1% of base runners in baseball. He might only be somewhere around the top 5% of base runners in baseball. The other thing that people long refused to believe is that Kris Bryant is a really good defensive player. The general line of thinking behind this belief boils down to this: "He's a 6'5" hulking slugger. He just can't be." Even before he entered the big leagues, a lot of people were already set to move him to a corner outfield position. Meanwhile, the people that had seen the most of him -- guys that know a lot about baseball, too -- disagreed. In a poll conducted by Baseball America, the AAA managers ascribing the top tools in their league, named Bryant the best defensive third baseman in the Pacific Coast League. According to UZR, which is one of the most reliable defensive measures, Bryant last year was worth 5.4 runs above the average major league third baseman per 150 defensive games. This year his UZR/150 at third is 12.4. So, while many didn't really believe he was capable of repeating last year's impressive debut defensively, he's actually been markedly better this year. I mentioned Bryant's disastrously low contact % earlier, and I said that he needed to improve in that regard. He has. A lot. His contact % is up from 66.3% last year to a respectable 72.3% this year. He went from the lowest mark in the league to being right around a number of other really good, slugging hitters with like-minded approaches like George Springer and Nelson Cruz. His gain of 6% in contact % is the third-highest gain in the league this year, behind Joc Pederson and D.J. LaMahieu. I've talked a lot about what kind of contact is preferable in my articles about Javier Baez. To be succinct, you want to make contact on pitches thrown in the strike zone. Last year, Bryant ranked last in the majors on Z-contact % (contact on pitches in the zone). His Z-contact % has gone up from 75.8% last year to 81.2% this year. Most of his gains in contact have come from contact in the zone. This is really nice to see. He's not swinging through as many exceedingly hittable pitches. The following two charts are from Bryant's zone profile at Brooks Baseball, showing how often Bryant swung and missed at pitches last year and then this year. Notice how the purple in the zone is now mostly blue and that there is far less red throughout. There are a few other minor grievances people had last year with Bryant. If you look at his splits from 2015, Bryant had a 36.6% K-rate and a .797 OPS against left-handed pitchers. This year, he is only striking out 19.4% of the time while OPS'ing .940 against left-handed pitchers. He also had only a .693 OPS on the road last year. This year his OPS on the road is 1.029. These are things that seem to be a little fluky. It's a small sample size. It's his first year. It's better not to worry about those things until we have more concrete evidence. We do now. And he's not such a weird player. Now, he's just really good however you slice it. When you add it all up, Bryant's been the best player in the National League this year. We've discussed some about how he got there. He's a great base runner -- ranking third in the majors in BsR since the start of last year. He ranks second in infield-hit % since the start of last year. He ranks 22nd in fielding value since the start of last year, according to Fangraphs. He ranks 18th in that measure this year. This measure is looking at how valuable a player is defensively compared to others at his position. It doesn't take into account which position you are playing. So, while a shortstop is more important defensively than a corner outfielder, his runs saved compared to other shortstops count the same as a corner outfielder's runs saved. After getting this fielding value number, there is then a positional adjustment made to each player. A first baseman will have some value taken away. A shortstop will have some added on. This makes sense. It's easier to play first than it is to play short. And first baseman are nearly all big sluggers. A center fielder that puts up the same offensive numbers as a first baseman is quite valuable. Not everyone can play center, so doing so and hitting like a first baseman is more valuable than hitting like that and playing first. Moreover, theoretically, moving a player down the defensive spectrum should make him a better fielder. A bad shortstop will save more runs for his team if he is playing second. So, this year, Bryant is actually being hurt by the positional adjustment, thanks to his versatility. Last year he had a positive positional adjustment of 1.5. This year, his positional adjustment is -1.1. This is fine. He's been playing a corner outfield position a lot more. He's also saved more runs in the outfield, on average, than he has at third. He's moved down the defensive spectrum more frequently, and he's been a better defender because of it. And he's still had more overall defensive value this year than last year. There was a concern that Bryant would lose some value by moving down the defensive spectrum. If a player is good at a premier position, you don't really want to waste that defense by putting him in a position that any random guy can play. It hasn't hurt Bryant, though. However, one might suggest that Bryant should actually be receiving more value because of his versatility. In the aggregate, a team's players' positional adjustments are going to even out. Someone has to get credited and debited for playing each position. So if Bryant is in left field, he gets the left field adjustment. Simple as that. In reality, things aren't quite that static. There is a hidden value in Bryant's versatility. His being able to play all over the field gives Joe Maddon a lot of options. Most importantly, it allows Maddon to use Javier Baez more often. If Bryant couldn't play the outfield, a less dynamic player than Baez, like Matt Szczur, would have to play the outfield more often. 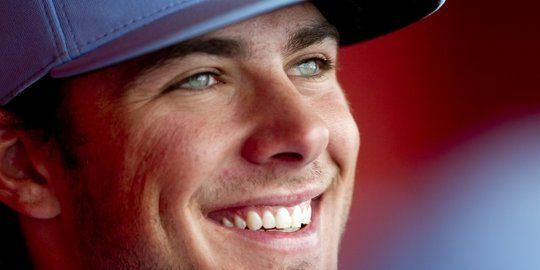 Bryant can be considered the fourth outfielder, despite also being the nominal starting third baseman. It allows Matt Szczur to remain an ostensible fifth outfielder, which is probably the role for which he is best suited. If an outfielder gets hurt, then Bryant can fill in there. If an infielder gets hurt, Bryant can stay at third, while Baez fills in for the injured player. It also allows Maddon to get completely crazy and play someone like Willson Contreras at first base or left field, depending on the situation, just to keep his bat in the lineup. Maddon can also get real crazy during games thanks to Bryant's versatility. He doesn't have to worry about, say, saving an outfielder on the bench when he starts getting into pinch hit opportunities. If he runs out of outfielders, he can just send Bryant out there. So he can base all of his decisions on matchups and timing. He can do double switches with any spot in the order. He doesn't have to worry about anything else, because Bryant and Baez allow him to move guys wherever he needs them. While, on its face, Bryant's stated value (or WAR) might seem correct, that perception might be a little off. Bryant also has helped the Cubs to get over a win in value out of Javier Baez. He's done this simply by allowing the Cubs to use Baez more often, instead of resorting to playing a lesser player, like Szczur. He's also probably augmented other bench players' value by allowing Maddon to use them in favorable situations. It's not like this hidden value is monumental or anything, but there is some there. A player being versatile isn't earth-shattering news. A lot of guys move around the diamond. Chris Coghlan could be called versatile, because he's played a lot of different positions over the last couple years. He's also been equally horrible at each of them. Bryant, however, ranks 7th in UZR/150 among third basemen that have played as many innings as he has there this year. He's also ranked 2nd in UZR/150 among left fielders who have played as many innings as he has there this year. He's also produced positive UZRs in RF in each of the last two years, in smaller samples. And, just for kicks, he's chipped in a defensive run saved this year at both first base and center field, according to DRS. Oh and he also played shortstop once. Because why the hell not? So, while his BABIP has gone down to .304, which is more in line with the league average, he's also hitting for more power. This probably should have been expected, to a certain degree. Bryant's always hit the ball hard. Since the start of last season, he ranks 10th in hard-hit %, according to Fangraphs. BABIP makes perfect sense, in theory. Not all batted balls are the same, though. There can be some fluky things that influence BABIP. If a guy who would normally see his hard-hit balls fly out of the park actually sees them stay in the yard, then his BABIP is going to be artificially inflated. Let's look at it this way: A guy hits the ball ten times. 3 of them go for singles, 6 of them for outs, and one goes for a homer over the left field wall. Now let's say the same guy hits 10 balls the exact same way he did as before, except, instead of that one flying over the left field wall, it actually smashes into the Green Monster, as he was playing in Fenway, giving him a double. The first guy's BABIP is going to be .333. The second guy's BABIP will be .400, though, all because of the Green Monster getting in his way. And the first guy will have an extra homer to his credit, to go along with better slugging numbers. This might help explain the differences between Bryant's BABIP and slugging numbers from 2015 to 2016. I couldn't tell you with any certainty if this is actually the case. I'm simply suggesting that it could be a factor. The balls that were falling in for hits last year are now flying over the fence. Bryant sure can hit baseballs, though. He's particularly adept at hitting fastballs and sliders. According to Fangraphs' pitch values, he ranks 10th against fastballs and 3rd against sliders. Per 100 fastballs, he's worth nearly 20 runs above what an average hitter is worth. If you are a relief pitcher with a fastball/slider repertoire... good luck going against Kris Bryant. Bryant's biggest gains as a hitter have probably been in his ability to make contact, as mentioned before. But, the power surge can't be too far behind. He's hitting a lot more homers and more doubles. And he's doing so without hitting more fly balls. His fly ball % is actually down from 45.2% last year to 44.8% this year. The only difference is that his HR/FB% is up from 15.8% last year to 22.1% this year. This is more in line with where he should be, considering his prodigious power. He's still the same effective hitter when not hitting home runs, and the extra home runs are just a cherry on top. His approach is the same. He's not selling out for power, like some players -- ahem, Todd Frazier -- do. A lot has been written about Bryant changing his swing over the off-season. The results have been stellar. He's got a perfect home run swing now. He's continued hitting massive, no-doubt homers, while also sneaking a few more out that he doesn't hit a mile in the air. We'll head over to Baseball Savant and use Statcast data to prove it. If you look at raw average exit velocity, Bryant doesn't fare extremely well. He ranks 43rd in baseball of players with 150 batted balls events. That's pretty good, but it isn't befitting a guy leading his league in home runs. He's fared better in average fly ball/line drive exit velocity, ranking 23rd. But, still, that's a little disappointing. The problem is that raw numbers on exit velocity don't tell the whole story. 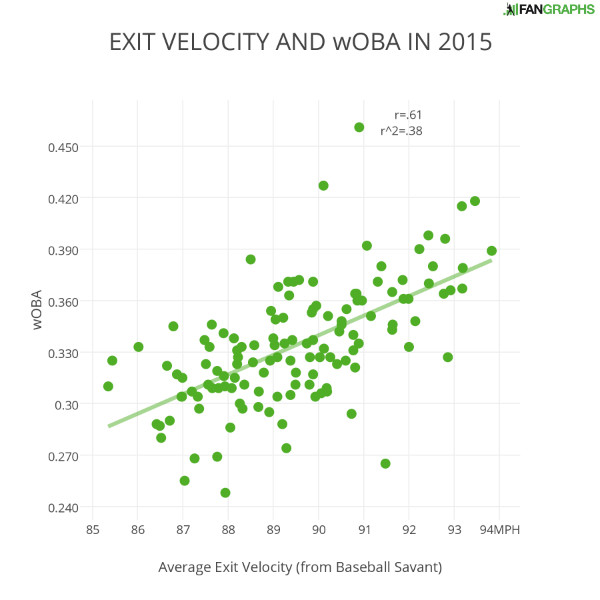 I've mentioned in a previous article that there is a correlation between average exit velocity and wOBA. But, not all hard-hit balls are the same. Some are grounders; some are homers; some are somewhere in between. And when we look at average exit velocity, we are taking everything into context. So all those 60-80 mph, weakly hit balls are dragging things down. And the difference between a 60 mph exit velocity and an 80 mph exit velocity isn't much. I've mentioned before that sometimes it is better to hit a ball at a lesser exit velocity. So throwing all of these batted balls events together into one concoction isn't going to give us the best picture. Not all batted balls make a difference in a game, anyway. It's usually just a few each game that matter -- often the long flies. We're going to look for those potential long flies. We'll start off by narrowing down our parameters, by taking out the types of batted balls that either aren't going to go for a home run or could be described as anomalous home runs. There have been 2,622 home runs hit this season. Only 94 have come at an exit velocity of 95 mph or less. Only 113 have come at a vertical launch angle of 20° or less. Only 41 have come at a vertical launch angle of at least 40°. Occasionally, you can carry one of these balls out of the stadium. But, far too often, this launch angle produces a ball that is too high to leave the park. So, we are simply going to search for all balls hit at least 95 mph and between 20° and 40° vertical launch angle. Kris Bryant ranks 6th in the league with 38 such batted balls. Not all of these balls are going to go for home runs. Sometimes a park's dimensions will keep the ball in play. Sometimes a defender might rob you of a home run. Sometimes both the park and defender will conspire to rob you of a homer. But, Bryant's hit a lot of balls that stand a decent chance of getting out of the park. We can narrow these parameters down a little more, too. There have been 2,553 balls hit between a 20° and 40° vertical launch angle and between 95 mph and 100 mph. Only 436 have gone for home runs. Some of them will get out, but more often these balls come up just short. So let's search for all balls hit between a 20° and 40° vertical launch angle and at least 100 mph. Bryant ranks 1st in the league under these parameters. Let's bump it up even a little more. There have been 2,097 balls between these launch angles and at exit velocities between 100 mph and 105 mph. Of these, 1,016 have left the park. These balls are more dependent on park layout and the location of where they are hit in the park. Our final search will be for all balls hit between a 20° and 40° vertical launch angle and at least at 105 mph. There have been 1,073 such batted balls. 879 have gone for home runs. These are mostly no-doubters. Very few parks are going to hold these balls, and it doesn't matter too much where you hit them. The average distance on these batted balls is over 410 feet. Again, Bryant ranks 1st in the league under these parameters. His new swing is perfectly tailored to hit home runs. He's mastered the craft of combining exit velocities and launch angles that are conducive to hitting home runs. We'll detour slightly from Baseball Savant, while still looking at Statcast data. Andrew Perpetua is using Statcast data to measure expected offense. This is some groundbreaking stuff. Here are the basics: He is taking every batted ball and throwing them into buckets, based on their exit velocities and vertical and horizontal launch angles. Whenever there is a batted ball, he can then measure what you would expect its result to be, based off of all the other similarly-batted balls in its bucket. This isn't perfect. For one, it's not precise. Essentially, the field is broken into grids. And this data doesn't take shifts into account, either. So a heavily shifted player's data will be skewed. Also, if you hit a line drive right to where a fielder would normally be expected to be located, your expected production is going to be less than if you had hit the ball just a little bit over to the side of where a fielder normally is. Maybe a guy might be getting lucky by finding where holes normally are, whereas another guy might be unlucky to keep hitting it right to where defenders normally are located. But, this will help remove a lot of luck and most defensive influence. And it will remove a lot of fluky stuff, too: balls that take tricky hops, a ball lost in the sun, etc. Mr. Perpetua is constantly updating and improving this data in a google doc, which can be found at xstats.org. Kris Bryant's actual wOBA is .391, which ranks 17th in MLB. His xOBA (or expected wOBA), according to Perpetua's data is .395, which ranks 8th in MLB, of players with at least 150 PA. If you look at some of the players that rank above Bryant in wOBA that have dropped below him in xOBA, you'll notice that a lot of them have really high BABIPs. Marcell Ozuna, Michael Saunders, Brandon Belt, Wilson Ramos... these guys have all been lucky to have offensive numbers that have surpassed Bryant's so far. And Bryant's numbers appear to be legit. If we take luck out of the equation, there's only a few guys in Bryant's stratum: your Mike Trouts and Manny Machados of the world. Oh, and we get to watch him play for the Cubs for the next six years.